"When a pianist can't practice, he loses his skill. It was the same with me. of those exercises, practice really...I didn't really take the film that seriously." There's an unusual but engagingly attention-grabbing character introduction early on in Morgiana, a captivating 1972 Czech film directed and co-written by Juraj Herz. As one of the dual female leads tucks into her breakfast, a subjective wide-angle shot snakes across the floor and makes its way towards the dining table. Is this an intruder? It seems unlikely at this height and speed, and neither the woman nor her sister react to its presence. A disembodied spirit perhaps? Could be. It then climbs onto the chair and observes the two women from across the table. Still they fail to react. Only then does a change of viewpoint reveal the identity of this mysterious entity. It's a cat. Suddenly all that has gone before makes perfect sense. It's a couple of minutes more before we learn the cat's name – Morgiana – and to which of the sisters it owes its fragile allegiance. Cats, of course, have a long history in horror and mystery stories. Movie dogs may be ferocious and have an almost psychic ability to recognise the bad guy, but cats have achieved a unique position in the hierarchy of movie animals, cast as enigmatic creatures who can be everything from vengeful spirits to hosts for human reincarnation. In European folklore they were companions to witches, in Ancient Egypt they were elevated to the status of gods. Black cats in particular have a special resonance. In the famed short story by Edgar Allen Poe, a black cat seemingly returns from the dead to haunt the story's narrator, and while Japanese mythology is littered with stories of animal spirits, the black cat holds a special position and is considered to be the most powerful of them all. But a cat doesn't need be black to be sinister or mysterious. Such is the legacy of the aforementioned Poe story that you only need a close-up of a cat coldly observing the perpetration of evil to know that it will somehow be instrumental in the downfall of the wrongdoer. And when the name of the cat is the title of the film, then there can't help be an expectation that the animal going to prove more than just feline window dressing. Central to the story, this story, are sisters Klára and Viktorie, who on the death of their father take possession of his bequeathed estate. Viktorie gets his country house and hunting lodge, and Klára gets the rest, which includes his villa, his shares, and the contents of his bank accounts, which we can assume from the surroundings amount to a pretty penny. Viktorie elects to move into the hunting lodge, known as The Green Flute, but Klára dislikes the place and declines an invitation to join her. Her unease, according to her sister, is down to a fear that the building is haunted by its former owner, a ballerina who was driven to her death by her jealous lover. It soon becomes clear that Viktorie is fiercely envious of her younger sister's popularity, especially with the dashing Lieutenant Marek, who is in love with Klára but dislikes Viktorie, who's clearly had her eye on him for some considerable time. A tarot reading suggests that all Viktorie desires will be hers if she can just deal with the woman who stands in her way, and to this end she procures a slow acting poison that is guaranteed to leave no medical trace. She drops it in Klára's tea, but as her sister's health starts to fail, Viktorie becomes tormented by guilt and is targeted for blackmail by the woman whose brother provided the potion. 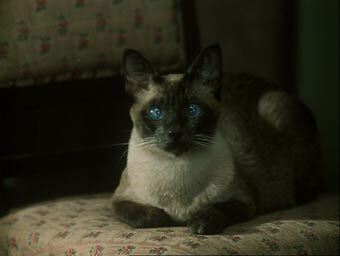 Although based on a 1929 novel by Russian writer Alexander Grin, there's more than a whiff of Poe about Morgiana,* from the role played by the cat to the manner in which the guilt of the crime haunts its perpetrator. 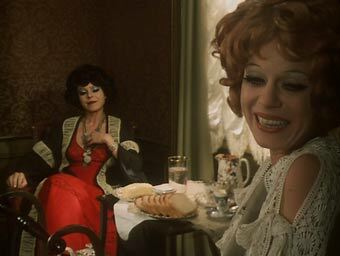 That it's a period piece helps, but exactly what period or even location remains an enigmatic uncertainty, a corner of rural Czechoslovakia trapped somewhere between the past and the present, in which candles adorn rooms with working electric lights, while the dress sense and makeup of the female cast suggests they are all auditioning for roles in one of Ken Russell's more flamboyant historical biopics. And yet like Russell at his most colourful, this gameplaying with reality enriches the surface detail of a film that is always much more than the mechanics of its plot, engagingly twisty and even surprising though they prove to be. Nothing about the handling could be labelled pedestrian. The opening funeral is a case in point, with its peculiar focus on the sisters' feathery headgear, the lowering of coffin onto the camera, and the concealment of the womens' faces beneath dense black funeral veils during the will-reading that follows, all of which establish an air of unease even before the first inkling of murderous intent. Following a title sequence peppered with abstract, quasi-vaginal paintings that would not be out of place in Obayashi Nobuhiko's bonkers 1977 horror opus Hausu, the sense that something is amiss between the two sisters is neatly captured by a slightly uneasy conversation about the closeness of their relationship that takes place in almost complete darkness. It's shortly after this that we get our first taste of the above-mentioned cat-camera, a point-of-view wander in extreme wide-angle that plays almost like a template for The Evil Dead's rightly celebrated wood-demon POV shots. As Viktorie puts her murderous plan into motion, Morgiana watches on like a feline surveillance camera charged with recording every misdeed for later prosecution in some supernatural court. 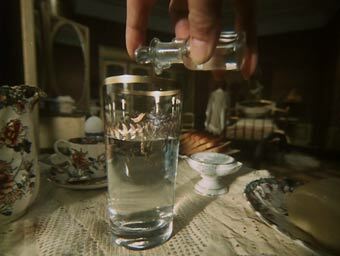 And having gone to so much trouble to procure just about the only super-wide lens in the country, director Herz and cinematographer Jaroslav Kucera were clearly keen to make full use of it, adding a troubling edge to scenes of emotional conflict and emphasising the increasingly ill Klára's disorientation and dizziness. This is taken a trippy step further when the image is fractured through the use of front-of-lens prisms, an effect I watched with a real sense of nostalgia, having used the very same trick a good many years ago in an early 8mm stab-in-the-dark attempt to capture the feel of a waking dream, something Herz and Kucera achieve here with aplomb. The tale unfolds like a melodrama on acid, exaggerated and restrained in the very same breath, with theatrical expressions of emotion tempered by a wealth of sometimes unsettling suggestive detail, much of which can only be properly appreciated on subsequent viewings. Even seemingly straightforward scenes are on second glance revealed to be anything but (just take a look at the framing and editing in the open-air sequence in which Viktorie eavesdrops on Klára and Marek) and can suddenly give way to unexpected angles, dizzying wide shots or intimate and sometimes semi-hallucinatory close-ups. Lubos Fiser's score, meanwhile, flits between the romantic, the creepily atmospheric, and the sort of bombastic brass fanfares that Hammer reserved for their most sensationalist shock moments. What could easily have resulted in a patchwork of styles comes delightfully together as a small gothic treat, an unusual and seductive hybrid of period (melo-) drama and post-60s experimentalism, one that gender-inverts Poe, buiding intriguingly to a final scene in which chance and irony collide in a manner that should play as preposterous, but somehow feels right for the story. And I can't help thinking that if the film were more widely seen, then Viktorie, with her black wardrobe, bright red lipstick, pronounced eye makeup, stern expressions, and darkly delicious malevolence, would have the potential to become the subject of a small but rather enthusiastic goth cult following. Framed in what we can presume is the original 1.33:1 ratio (Second Run are not in the habit of cropping films and the framing here never feels cramped or inappropriate), this is a solid transfer that in most respects is well up to the company's own high-set standards. The colour scheme leans towards earthy hues – which oddly enough gives it a rather modern feel, given the current popularity of post-production tinkering – but richer colours do intermittently pop though. Black levels are generally solid, though sometimes at the expense of shadow detail, something particularly evident in darker scenes, of which there are many. A fair few dust spots remain, but the picture stability is solid and the level of detail impressive. The Dolby 2.0 mono soundtrack lacks the crispness and range of a more modern film, but is always clear and there is never a hint of distortion. The odd small pop and crackle can be heard, but is never seriously distracting. The English subtitles are nicely handled, hopping to the top of the screen when they would otherwise obscure the recumbent Klára's face. The film's director talks frankly about why he chose to adapt Grin's novel, how he differed from his fellow Czech filmmakers of the time, the technical issues of having an actress play a dual role, his relationship with cameraman Jaroslav Kucera and their fondness for wide-angle and experimentation, his direction of music, the government reaction to the film, and more. Also included in the package is a Booklet containing a useful introduction to Herz's work by freelance writer Daniel Bird and a more analytical piece on Morgiana and The Cremator by Dr. Ian Conrich, a leading writer on Gothic cinema. Three viewings in and I'm completely sold. Morgiana has all the irresistible gothic intrigue and narrative twists of Corman's Poe adaptations, fired through with an experimental verve and the confidence and energy of the Czech New Wave. It's another fine East European rediscovery from Second Run, whose 2006 release of director Juraj Herz's earlier The Cremator has now bounced to the top of my DVD shopping list. Enthusiastically recommended. * Grin was apparently regarded by some as the Russian Edgar Allen Poe and is so described in the accompanying booklet. ** This casting decision may well stem a key aspect of Alexander Grin's original story, Jessie and Morgiana, where Viktorie and Klára were apparently dual personalities of a singe individual. I have, I should point out, neither read the story nor been able to confirm this, but in the accompanying interview director Juraj Herz states that schizophrenia was a strong aspect of his original cut but that the scenes in question were cut by the state.